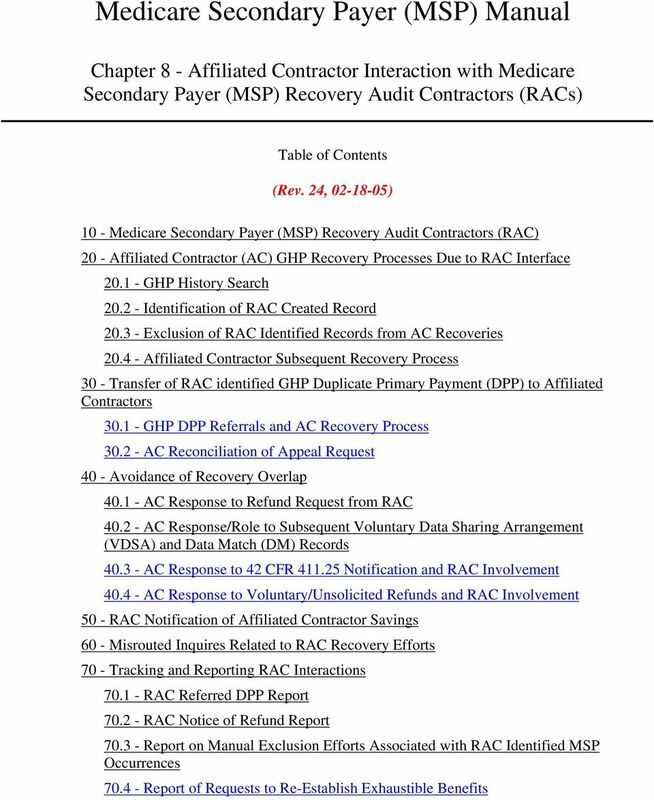 Download "Medicare Secondary Payer (MSP) Manual"
3 10 - Medicare Secondary Payer (MSP) Recovery Audit Contractors (RACs) Rev. 24, Issued: , Effective: , Implementation: ) Section 306 of the Medicare Modernization Act (MMA) is entitled Demonstration Project for Use of Recovery Audit Contractors. This provision requires the Secretary to conduct a demonstration project for not longer than three (3) years to identify Medicare underpayments and overpayments and to recoup overpayments for both Part A and Part B services. A Report to Congress is required six months after completion of the project. The report will contain analysis specific to the impact of the demonstration on Medicare savings and recommendations on extending or expanding the project. 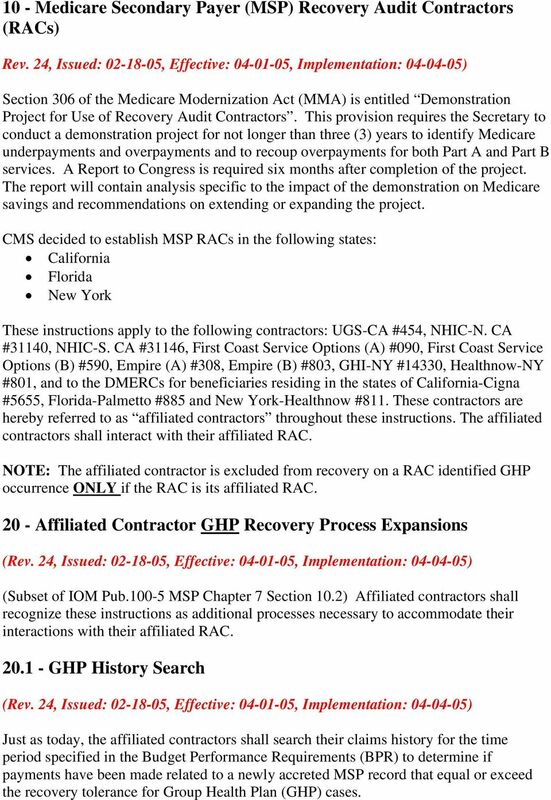 CMS decided to establish MSP RACs in the following states: California Florida New York These instructions apply to the following contractors: UGS-CA #454, NHIC-N. CA #31140, NHIC-S. CA #31146, First Coast Service Options (A) #090, First Coast Service Options (B) #590, Empire (A) #308, Empire (B) #803, GHI-NY #14330, Healthnow-NY #801, and to the DMERCs for beneficiaries residing in the states of California-Cigna #5655, Florida-Palmetto #885 and New York-Healthnow #811. These contractors are hereby referred to as affiliated contractors throughout these instructions. The affiliated contractors shall interact with their affiliated RAC. 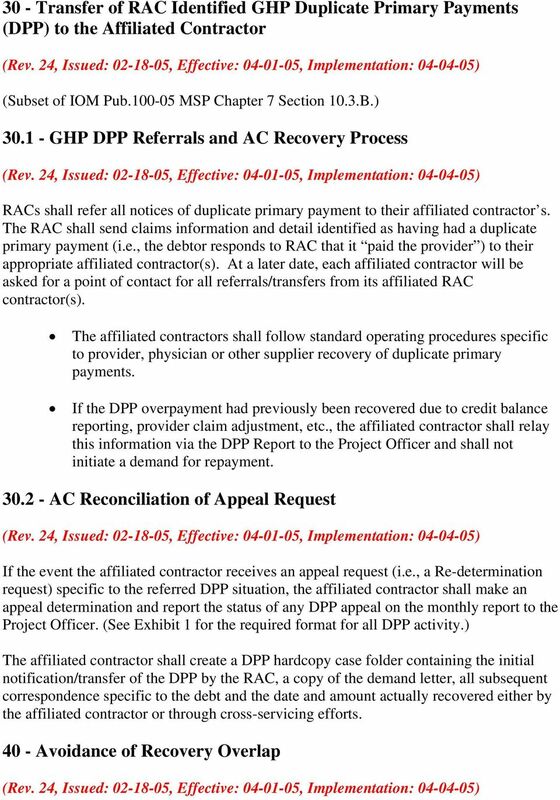 NOTE: The affiliated contractor is excluded from recovery on a RAC identified GHP occurrence ONLY if the RAC is its affiliated RAC Affiliated Contractor GHP Recovery Process Expansions (Subset of IOM Pub MSP Chapter 7 Section 10.2) Affiliated contractors shall recognize these instructions as additional processes necessary to accommodate their interactions with their affiliated RAC GHP History Search Just as today, the affiliated contractors shall search their claims history for the time period specified in the Budget Performance Requirements (BPR) to determine if payments have been made related to a newly accreted MSP record that equal or exceed the recovery tolerance for Group Health Plan (GHP) cases. 9 procedures along with the processes defined below. See also Pub Transmittal 50 issued July 30, 2004 (CR 3274). 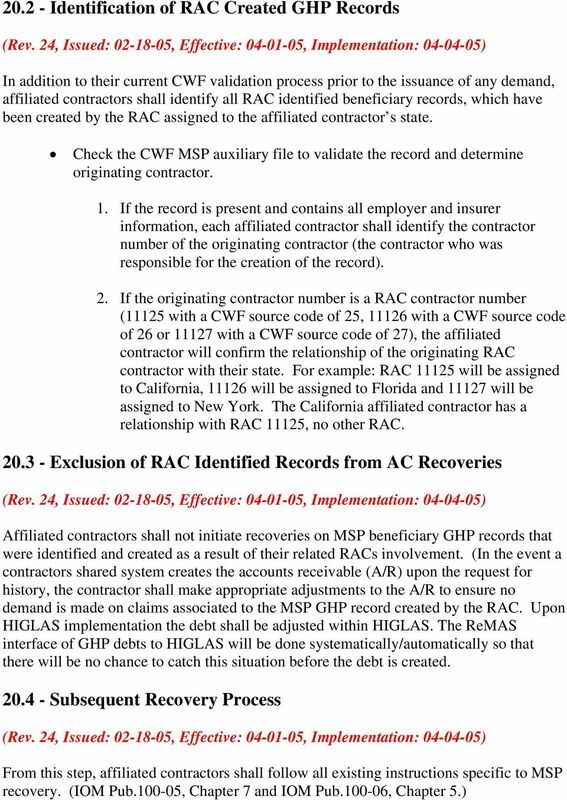 If the voluntary/unsolicited refund is specific to a GHP issue, the affiliated contractor shall confirm if a GHP record exists on CWF and if the record is attributed to the contractor s affiliated RAC. 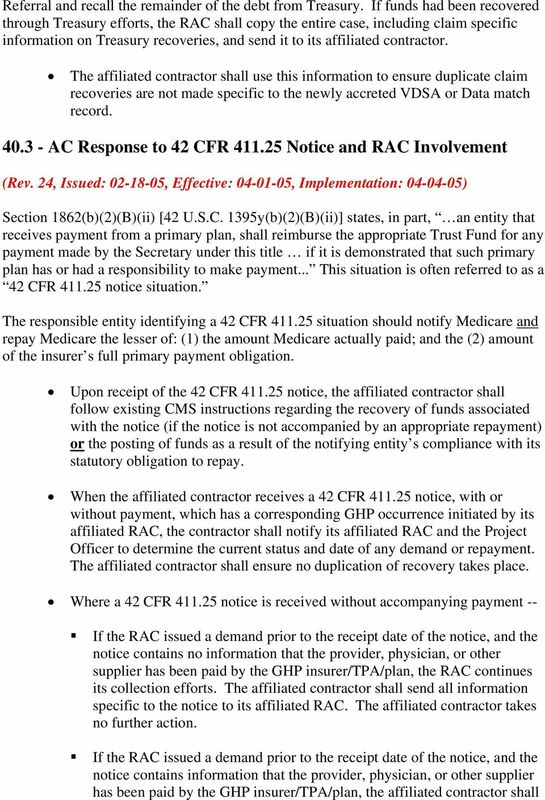 If yes to both of these conditions -- If the RAC issued a demand prior to the receipt date of the unsolicited/voluntary refund, and the notice contains no information that the provider, physician, or other supplier has been paid by the GHP insurer/tpa/plan, the RAC continues its pursuit on any recovery claims associated with the MSP occurrence that have not been repaid. The affiliated contractor shall inform the RAC of claims associated with the payment received. 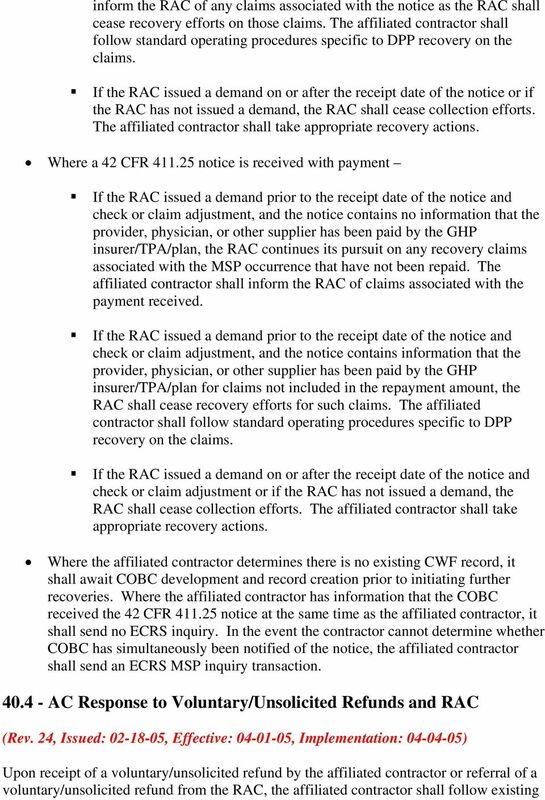 If the RAC issued a demand prior to the receipt date of the unsolicited/voluntary refund, and it contains information that the provider, physician, or other supplier has been paid by the GHP insurer/tpa/plan for claims not included in the repayment amount, the RAC shall cease recovery efforts for such claims. The affiliated contractor shall follow standard operating procedures specific to the DPP recovery effort on the claims. If the RAC issued a demand on or after the receipt date of the unsolicited/voluntary refund or if the RAC has not issued a demand, the RAC shall cease collection efforts associated with the MSP occurrence. 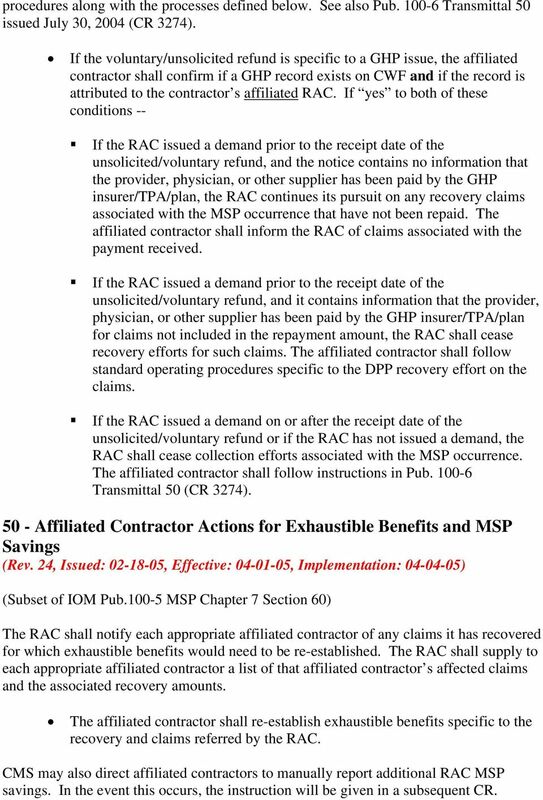 The affiliated contractor shall follow instructions in Pub Transmittal 50 (CR 3274) Affiliated Contractor Actions for Exhaustible Benefits and MSP Savings (Subset of IOM Pub MSP Chapter 7 Section 60) The RAC shall notify each appropriate affiliated contractor of any claims it has recovered for which exhaustible benefits would need to be re-established. The RAC shall supply to each appropriate affiliated contractor a list of that affiliated contractor s affected claims and the associated recovery amounts. The affiliated contractor shall re-establish exhaustible benefits specific to the recovery and claims referred by the RAC. 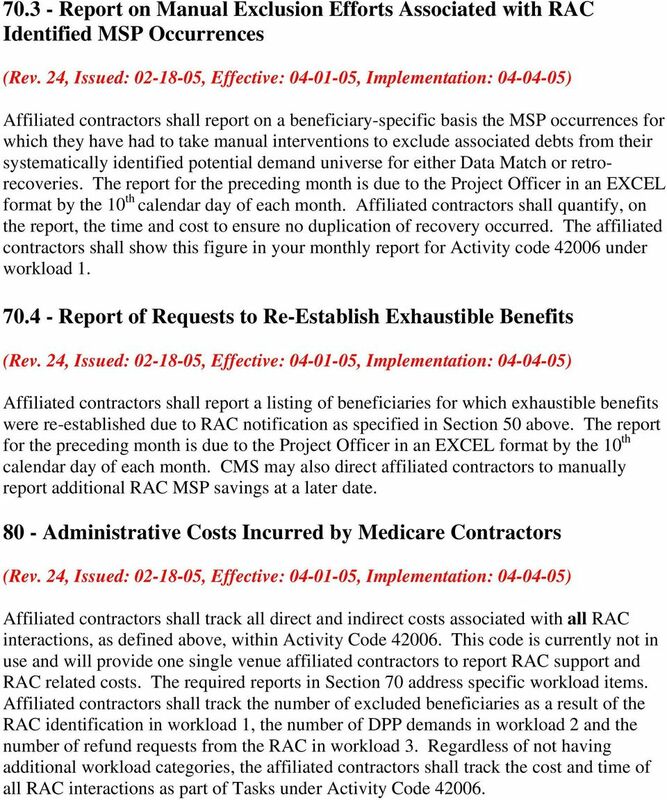 CMS may also direct affiliated contractors to manually report additional RAC MSP savings. In the event this occurs, the instruction will be given in a subsequent CR. 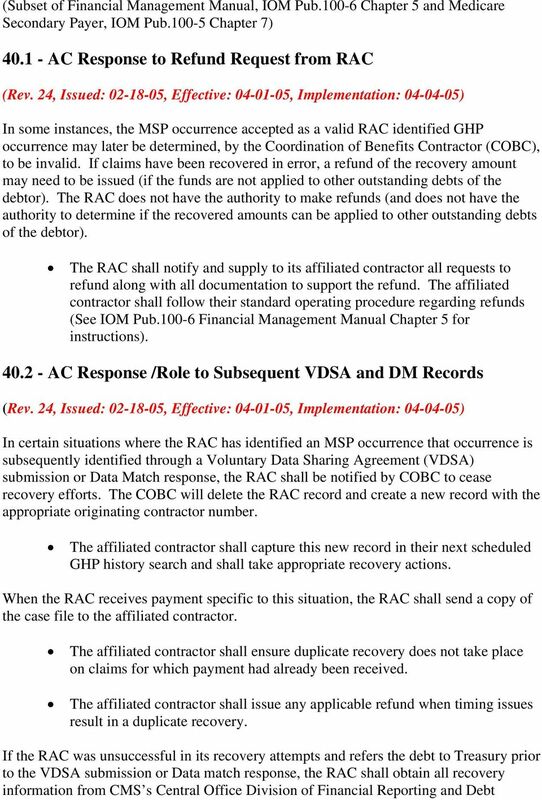 10 60 - Misrouted inquiries (phone/paper/fax) related to RAC Recovery Efforts The affiliated contractor receiving inquiries either by phone, fax or hardcopy paper inquiries specific to a beneficiary where CWF currently shows the MSP occurrence was identified by the RAC, shall document the phone conversation and refer the documentation to the RAC. The method of referral may be fax. The affiliated contractor shall supply the inquirer the appropriate RAC telephone number. 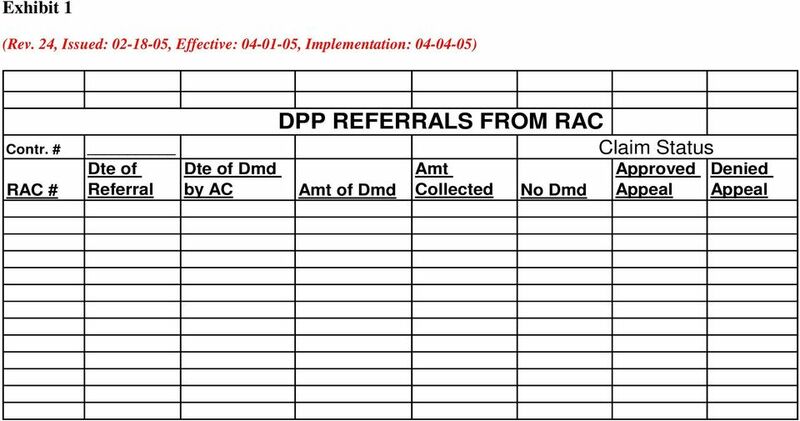 Listed are each RACs Point of Contact, addresses and phone numbers: California: Florida: New York: RAC (TBD) RAC (TBD) RAC (TBD) 70 - Tracking and Reporting RAC Interactions RAC Referred DPP Report Affiliated contractors shall report DPP referrals from their affiliated RAC. The report for the preceding month is due to the Project Officer in an EXCEL format by the 10 th calendar day of each month. The report shall include the following categories: Date of Referral, Date of Demand, Amount of Demand, Amount Collected, Status of Overpayment (use Exhibit 1). The affiliated contractor shall report all RAC referred DPP affiliated contractor efforts within Activity code under workload RAC Notice of Refund Report Affiliated contractors shall report debt specific information regarding all RAC Refund Requests. The report for the preceding month is due to the Project Officer in an EXCEL format by the 10 th calendar day of each month. The affiliated contractor shall include a column with the reason for each refund. Reason descriptors shall include: 1) erroneous beneficiary record creation, 2) appeal decision favorable to provider/supplier (for DPP), etc. (See prior Sections to determine refund applicability.) 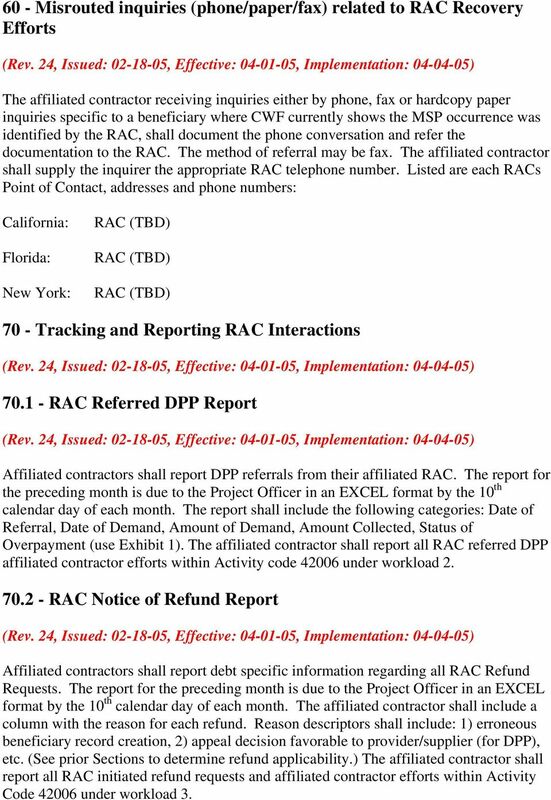 The affiliated contractor shall report all RAC initiated refund requests and affiliated contractor efforts within Activity Code under workload 3. The Recovery Audit Contractor Program: What Every Physical Therapist Needs to Know! How to Successfully Appeal a RAC Audit. Kelly McCloskey Cherf Hogan Marren, Ltd.
To facilitate identification, please refer to Common Identification No. A-05-0 l-00033 in all correspondence relating to this report. Medicare Program; Reporting and Returning of Overpayments. AGENCY: Centers for Medicare & Medicaid Services (CMS), HHS.